The types of statements noted along the text column refer to Bruno Latour's classificatory scheme from his study on laboratory life from 1979.
statement - or lack of the same. 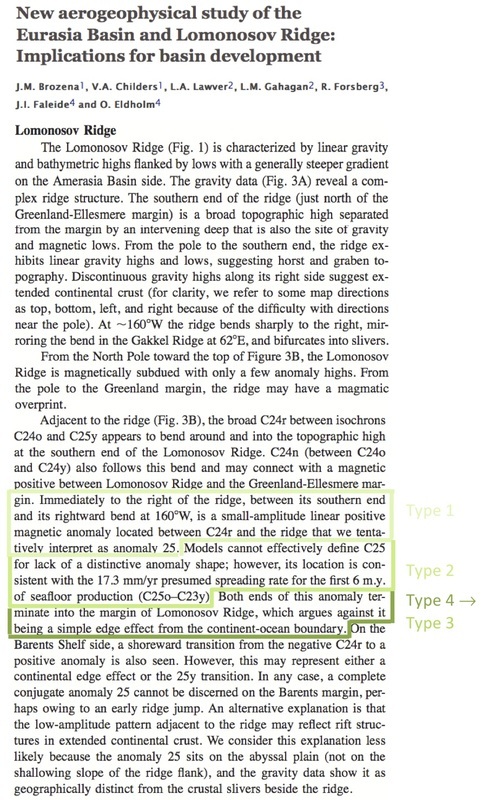 The text identifies a magnetic anomaly (anomaly 25) in the Amundsen Sea. The effect of anomaly 25 is that the evolution of the Eurasian basin is linked to a previous spreading of the Labrador Sea. The identification of anomaly 25, which is basically a local variation in the magnetic field of the Earth, becomes constructive of the historical development of the Arctic underground. 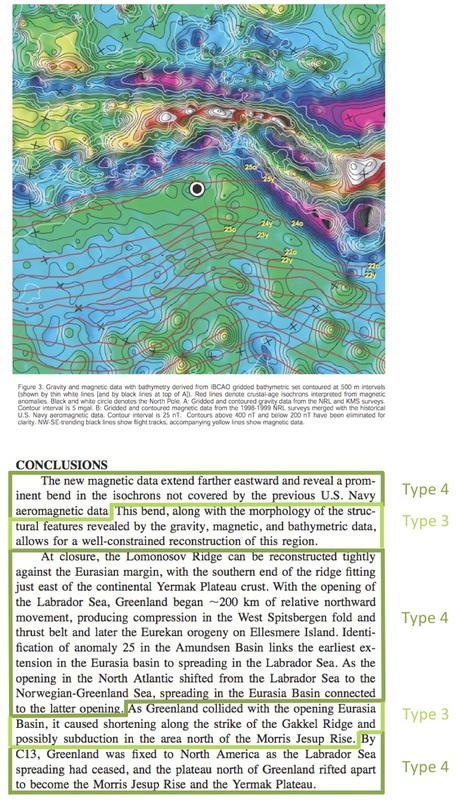 The text locates a positive magnetic anomaly between a specific isochron and the Lomonosov Ridge and refers to it as anomaly 25 in a type 1 statement (“we tentatively interprets it as anomaly 25”). The shape of the anomaly is also described in a type 1 statements (“models cannot effectively defined C25 for lack of a distinctive anomaly shape”), but the text advances to a type 2 statement when describing the location of the anomaly (“consistent with the 17.3 mm/yr presumed spreading rate for the first 6 m.y. of seafloor production (C25o-C23y)”). Interestingly enough, a textual shift happens in the conclusion. Here anomaly 25 is turned into a type 4 statement, describing what appears as an uncontroversial relation: “Identification of anomaly 25 in the Amundsen Basin links the earliest extension in the Eurasia basin to spreading in the Labrador Sea.” Through a transformation of anomaly 25 from a type 1 or 2 statement to a type 4 statement in the conclusion, the persuasive force of the magnetic anomaly 25 is increased throughout the article. Anomaly 25 illustrate how a scientific fact is produced textually and turned into a powerful argument. It is also important, however, to understand how a geological fact, such as anomaly 25, might afford a future closure of the claims to the Lomonosov Ridge. A critical piece of evidence in the claims to the Lomonosov Ridge is the nature of the contact between the ridge and the continental crusts. In this regard the history of the seafloor spreading, investigated in the aerogeophisical study with reference to magnetic anomalies, might come to play a crucial role. Apparently Russia seeks proof that the Lomonosov Ridge is not a normal mid-ocean seabed. In stead information is strived for, which proves the Lomonosov Ridge to be – or at least has been – a natural extension of Siberia. Due to faulted geology between the Lomonosov Ridge and the Siberian shelf, the hypothesis is that the Lomonosov Ridge – along with the Eurasian shelf – has slid into its current position. The Lomonosov Ridge is an example of how questions about ownership over Arctic territories are completely dependent on interpretations of what the Arctic is in a broader sense – in this case specifically the Lomonosov Ridge. In order to determine to whom it belongs, we must first get a scientific identification of what the Lomonosov Ridge is – in a contemporary and a historical sense. The nature of the Lomonsov Ridge is constructed through scientific documents, which (as demonstrated above) turn statements into increasingly persuasive facts. As we have seen, what constitutes the Lomonosov Rigde is not merely rocks and magnetic fields, but also a persuasive interpretation of the historicity of the ridge.